I LOVE this cake! I have had this recipe for at least thirty years. It is truly one of my favorites. When the cake is just first out of the oven, you pour this sweet hot glaze over the top. I love the sweet crunchy edges of the cake. I know it has five eggs, and oil.... but just make it! You will love it!! 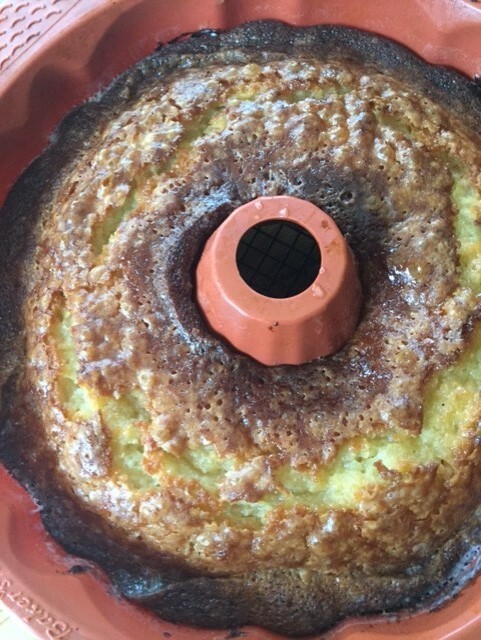 I couldn't decide how to take a decent picture so I just snapped a picture in my silicone bundt pan. Mainly to show you how much I love..... a silicone bundt pan. The preschool teachers gave me this as a gift and I love it. I still greased and floured but cakes come out perfectly! These edges are not burnt - fabulously crunchy and sweet!! Mix first six ingredients. Add the dry ingredients and stir until mixed. Pour mixture into a greased and floured bundt pan. Bake at 350 for 50 minutes to an hour. Ready when knife or testing stick comes out clean. Towards the end of the baking time, mix the above ingredients and bring to a boil. Pour over the cake as it is removed from the oven. Let cake set until cooled before inverting cake onto servingplatter.